Richardson, Texas, April 8, 2019 – NetPower announced the release of its 3U height VPX power supply (VPX-3U-1D500) at electronica China 2019 in Shanghai, China. VPX-3U-1D500 works with a continuous input voltage of 18-36V, and provides a maximum total output power of 500W. VPX-3U-1D500 has six standard outputs including three main outputs (+12V_MAIN/40A, +5V_MAIN/25A and +3.3V_MAIN/25A) and three auxiliary outputs (+3.3V_AUX/6A, +12V_AUX/1A, -12V_AUX/1A). The optional I2C communication supports both PMBus and IPMI interfaces for monitoring the electrical parameters as well as the temperatures at the card edges and in the middle of the chassis. 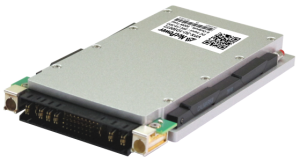 VPX-3U-1D500 operates with a typical conversion efficiency of 90% and is equipped with a full set of input and output protections. This VPX power supply also features active current-share on +12V_MAIN、+5V_MAIN and +3.3V_MAIN; all three auxiliary outputs have built-in OR’ing MOSFETs or OR’ing diodes to support operate in parallel as well. This NetPower VPX power supplies is compliant with VITA 62, MIL-STD-704(B-F), MIL-STD-461 and MIL-STD-810G. Please contact sales@netpowercorp.com for more information.